Inventing Australia is one of those books that appears in many, many bibliographies but I hadn’t read it until now. 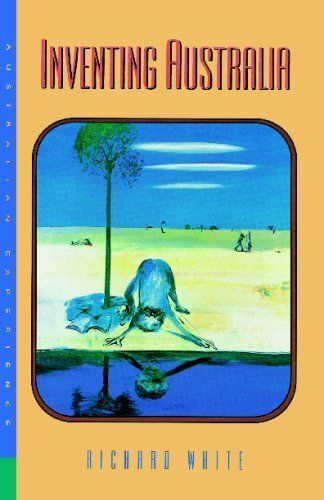 The grammar of the title is important- Inventing Australia- because his argument is that the search for a distinctively Australian identity is an ongoing and never-ending one. It’s not like Benedict Anderson’s Imagined Communities where the tense of the title suggests that the concept of community identity has been developed and reified. This seems unremarkable enough, as does much of his argument in the book because it has infiltrated our understanding of the creation of national identity so thoroughly that it is no longer particularly discernable as White’s argument alone. I had to remind myself that the book was written in 1981 and although there have been several reprints and White has written other works, this particular book itself remains in the original edition and has not been updated. The language that runs through the book speaks of classes, intelligentsia and bourgeoisie, which places it firmly within a 1970s/80s historiography. It traces through the different images of “Australia” that have been projected by different groups over time- early explorers like Dampier and Cook; Enlightenment philosophers, Social Darwinists, the critics and promoters of transporation, and the critics and promoters of immigration. Sometimes the image of Australia was consciously crafted by a small group of the intelligentsia, as with the bohemians from the 1890s onwards, who used their “brand” as a form of artistic protectionism for the local cultural industry. At other times images have been co-opted by conservative forces, as with the returning soldiers after WWI. Much of this argument builds on, and has been taken further by other historians writing on these topics at much the same time. I think that John Hirst’s Convict Society and its Enemies, written in 1983, is a more nuanced argument than the one that is presented here; Graeme Davison had already noted the urban origins of what we think of as “bush” poets and artists in 1978 and Ken Inglis and Geoffrey Serle had already discussed the creation and co-option of the Anzac legend. It’s impossible to tease out, after thirty years, the genealogy of many of these arguments, and to work out what was completely new in White’s book and what has been built on further and incorporated into the work of other historians who followed him. However, what does emerge clearly is his insistence that many of the influences that fed into different depictions of Australian identity were Empire-wide and not Australian at all. For example, he speaks of the approval given to the “bushman soldiers” in the colonial troops as a whole during WWI- not just the ANZACS. There was an Empire-wide expectation of the Coming Man, exemplified by empire-wide publications called”Young Australia” and “Young Canada” that were part of a series that was customized for each country. He underscores the importance of “whiteness” in the conceptualisation of the Coming Man, again part of a wider movement. He notes the shift from the search for a “national type” with its uneasy fascist over-tones to a promotion of “The Australian Way of Life”, just as vague and useful as an exclusionary device in post-war Australia as it is today. Again, he emphasizes that this part of a more general Western trend, and one that was literally more conservative (in terms of keeping what we already have) and less likely to be co-opted by radicals. The book finishes with the 1970s youth culture, dissatisfaction over Vietnam, New Left intellectuals, the women’s movement and multiculturalism. Reading the book thirty years on, the ending seemed rather abrupt and many other later developments flood to mind – tourism, changes in multiculturalism and immigration patterns, new media, the History Wars- the list goes on and on. How would these events challenge or alter his hypothesis? I wonder. Nonetheless, I’m pleased that he has resisted the temptation to keep adding new chapters to the book. The full title of the book is Inventing Australia: Images and Identity 1688-1980. Its chosen time frame takes it right up to what were then current events for a book published in 1981. The argument is made for the time span he chose, and to keep updating it would lessen its force as a historical argument which makes sense within its own chronological parameters. This entry was posted in Australian history, Book reviews. Bookmark the permalink. Sounds as though he ended it with the intention of adding to it in future revisions, perhaps? Have been researching newspaper archives and came across mention of regional councils discussing ‘the need to encourage more immigrants to our shores and into the country (rural) ‘ particularly those with varying skills approx. early 1900s lol. Yes, trends have changed in some ways but still the same in others lol. It does finish with a bit of “I wonder what’s coming next” feel about it. But as I said, I’m pleased that he didn’t keep adding to it- I think that it’s more self-contained as an argument stopping where it does. I’ve also been noticing that business has been rather quiet about the calls to reduce immigration. It reminds me a bit of the calls for the continuation of transportation. Sounds interesting! Is he an historian or a ‘social commentator’? That ‘Driving to Australia’ project (overland jounreys) looks interesting too especially *chuckle* the bit about drawing conclusions about the relationship between masculine identity and the modern motor car! Business has been remarkably quiet about everything, even things you’d expect them to comment on, e.g. company tax. Perhaps they scent an election to close to call?